Join in a group sound healing session or retreat. To receive notifications of upcoming events or retreats, follow me on Facebook or join my mailing list via the end of this page. Since the beginning of time, our human evolution has developed from pure sound vibration and wild foods. 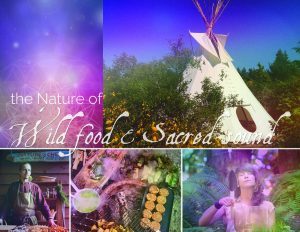 Join us for a magical experience of dinner and sacred sounds within a tipi on sacred land as we journey through the senses. Nature’s Chef, Tom Kral, will create a wild-crafted meal prepared by the element of fire. The food journey will be plant-based and consciously created. After dinner, to soothe our digestion, sound healing practitioner, Astaria, Light of Sound, will lead us through a magical Harmonic Sound Journey. Music and sound have the unique ability to cultivate a sense of love, peacefulness, and clarity throughout every cell in the body, whilst bringing one into alignment with truth, higher consciousness, and connection with the Divine. Sound Vibration allows the body to entrain to a higher frequency, creating space for self-healing, heightened awareness, and remembrance of one’s truest form.